Three American Presidents share Irish ancestry; Presidents Kennedy, Reagan, and Obama. In recent years, that fact has made the Republicans uncomfortable, but this year, as St. Patrick’s Day approaches, their worst nightmare will bring their propensity for hypocrisy into play: the Republicans hate the Communists and they hate Obama so being forced into a binary choice will deliver an uncomfortable decision: racism or McCarthyism? The fact that some Republicans seem to be endorsing Putin over the American president in the Crimean Crisis speaks for itself. Would it be ironic if some genealogists offered a theory that St. Reagan and Obama were related? Is it true that Adolph Hitler, who was a well known vegetarian, gave himself a dispensation from the usual rules by ordering corn beef and cabbage every year when Saint Patrick’s Day was celebrated at Berchtesgaden? Is it true that one of the founding members of the Black Panthers would astound his posse by producing evidence that he held dual American and Ireland citizenship because he was born as an “Army brat” son of an American Air Force officer serving at a base on the Emerald Isle? Ernesto Guevara Lynch’s son became known to the world as Che Guevara. You don’t find many references to that fact when St. Patrick’s Day celebrations are being held in the United States. In the U. S. vs. Mexico war, induced by offers of higher pay than the American army paid and land grants, a group of gringos led by some Irish with military experience, fought on the side of Mexico. They were called Batallón de San Patricio (Saint Patrick’s Battalion). Many of those who survived battle were hanged (30 simultaneously) for treason. Some (urban legend?) escaped and became Mexican landowners. Aren’t sailors on the USS O’Brien the only crew in the U. S. Navy that is permitted to wear green baseball caps rather than the regulation Navy blue gear everyone else must use? For many years, the St. Patrick Day celebration in New York City was very popular with college students because back then the State of New York had a drinking age of 18 and was surrounded by states where it was 21. Talk about “Aye, lad there’s the rub.” Eventually political pressure was used to convince New York to change it’s drinking age laws to 21. George Berkeley has been described as being the only philosopher from Ireland. He traveled to the United States. A town “near Harvard” was going to be named after him, but an error by a court clerk changed the spelling of the town to Berkley. A city in California was also named for him. The Californians weren’t content to just spell the name correctly’ it was also decided to build a better University in the city a few miles East of San Francisco. 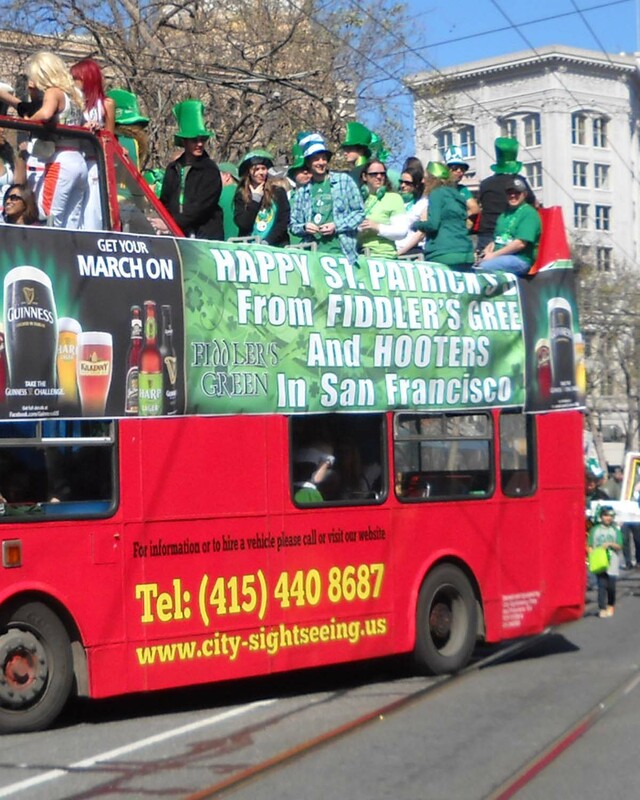 The Saint Patrick’s Day Parade in San Francisco this weekend is being touted as the 164th installment of the annual celebration. The California town of Dublin will also have a parade this weekend. [Note from the photo editor: We dug up some photos from a past Saint Patrick’s Day Parade in Frisco. Now the disk jockey will play the Rolling Stones’ “Flight 505,” the Irish Rovers’ “The Unicorn,” and he rarely does dedications, but just this once, for Clint Eastwood, he’ll play John McCormack singing “The Empty Chair.” We have to go try to solve the riddle: “Why can’t Irish employees be given a lunch break?” Have a “Sinn Fein (it’s pronounced Shin Fain and means “Ourselves alone”)” type week.